What better way to spend the dwindling days of summer than with 18 holes on some of Central Texas’s scenic golf courses? The area around Plum Creek features a wide variety of courses to challenge and delight every player, whatever their skill level or taste. Whether it’s to talk business or just to relax and play, these nearby courses will allow you to enjoy the Texas Hill Country at its finest. Just South of Austin, The Grey Rock Golf Club offers world class amenities only 30 minutes away from Plum Creek. With a spacious clubhouse nestled in a grove of live oaks, it’s a picturesque venue, great for relaxing after a round on the course, or for holding an event. The club also boats extensive practice facilities, with a well maintained putting green and driving range. With a friendly staff and a great layout, this course promises a superb golfing experience surrounded by the gorgeous Central Texas scenery. Landa Park Golf Course in New Braunfels is located adjacent the serene Comal River. Known for being well manicured and maintained, this course also is often visited by local wildlife such as deer and wild turkeys. With a challenging layout and a beautiful setting, this course truly showcases the natural beauty of the Texas Hill Country. A great choice for golf outside of the immediate Austin area, the river setting is what truly makes this course stand out. Right here in Plum Creek, the Plum Creek Golf Course offers a high-caliber golf experience just minutes away from home. This Texas-sized course on over 200 acres offers challenging play with unique character in the heart of the Plum Creek community. Seeded to stay green all year round, this course is one of the best in the area and also home to the Texas State Men’s and Women’s golf teams. Designed so that no two fairways touch, and with black tees at a challenging 7100+ yards, Plum Creek offers a distinctive golf experience that all players will enjoy. As Austin’s largest municipal golf complex, the Clay-Kizer facility offers players 36 holes on two courses in South Austin. These small courses are known for being reasonably priced and well maintained, and suitable for players of all levels. With tree-lined fairways surrounded by Williamson Creek, these courses offer a variety of play at one convenient location. Five sets of tees make the course the right challenge every player. An Austin staple since 1974, these muni courses are a great golf experience at an affordable price. One of the most highly rated courses in all of Texas, the Fazio Foothills at Barton Creek offers a stunning experience in the heart of Austin. Known as the hardest of the four Barton Creek courses, nearly every hole of The Foothills boasts fabulous, postcard-worthy views. Though the Fazio Canyons is the signature course at Barton Creek, The Foothills is a local favorite as well. This premiere course features waterfalls and caves and takes advantage of the best of Central Texas’s natural features. It’s a little pricier, but the resort facilities and unforgettable layout are worth it. Ranked first in Golfweek’s 50 Best Resort Courses in the US and also named the Best Resort Course in Texas by Golf Digest, this course is one of Central Texas’s must-plays. The movies are coming to Kyle! 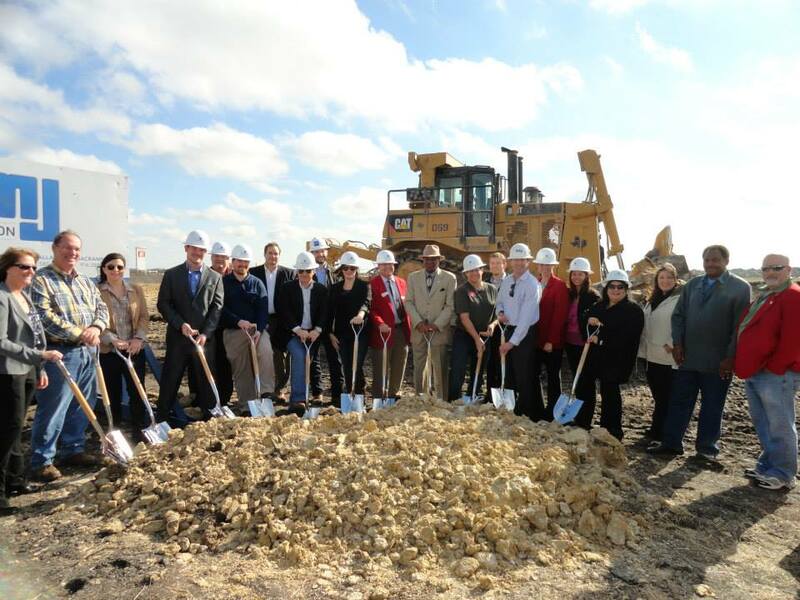 Construction on the city’s first movie theatre and entertainment complex – the EVO Family Entertainment Center – has begun. And by November of this year, residents of Kyle will be able to go to the movies, play bowling and laser tag just minutes away from home. The complex will feature an 11-auditorium theatre, a 14-lane bowling center, a “casino style” arcade floor featuring video and redemption games, and a full-scale restaurant and bar. In anticipation for the November opening, here are some other movie entertainment options available around Plum Creek for date nights, girls’ night out or for family-friendly entertainment. In South Austin at the intersection of Mopac and Slaughter Lane lies The Alamo Drafthouse, an Austin establishment that offers visitors movies, alcohol, delicious food, and themed/special events. The Drafthouse hosts special screenings, the latest blockbuster releases, as well as sing and quote-a-longs for adults and children to enjoy. Additionally, the Slaughter Lane Drafthouse is home to 400 Rabbits, a cocktail lounge adjacent to the movie theater that features Spanish-inspired bites and specializes in tequila and mescal based cocktails. The programming at Alamo Drafthouse changes every month and can be viewed on the theater’s website. This month they’ve been featuring the Bring it On Cheer-Along and special subtitled showings of Hayao Miyazaki’s newest movie, The Wind Rises. The Alamo Drafthouse also offers convenient ticket purchasing via their official app available in the iTunes app store. And remember – events at the Drafthouse are popular, and unlike a traditional movie theater, the Alamo Drafthouse requires movie-goers to reserve seats online before attending a show. 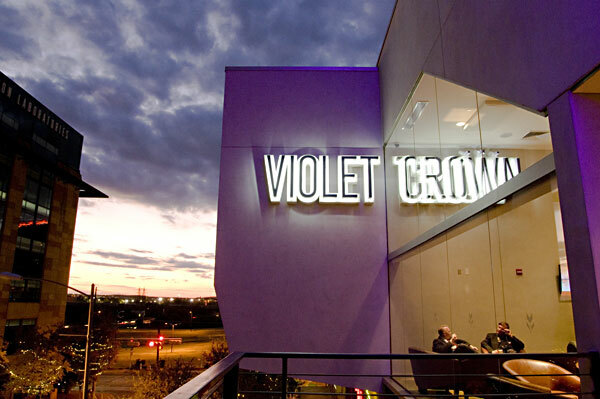 Deeper into Austin (downtown to be exact) Violet Crown Cinema is another food-and-movie establishment located in the 2nd Street District that offers moviegoers an upscale theater experience. The theater’s four screens are devoted to independent, documentary and international and the cinema bar and café offers a full cocktail bar and an appetizer menu with a wide range of options, too. Tickets for the cinema can be reserved and purchased online and the schedule of shows can also be found on the Violet Crown website. Just south of Kyle, Texas Cinema Showplace in San Marcos offers a movie experience on the cheap – $1 to be exact. It’s a small theater, with only three auditoriums that show movies once they’ve left the big screen, but they’re a dollar or less and close to home – can’t beat that! With these theaters and more around Kyle, there are plenty of entertainment options available for Kyle residents to enjoy until November when EVO opens its doors! With miles of hike and bike trails, wide open spaces and pocket parks galore, Plum Creek is a neighborhood that privileges fitness and outdoor activities. And being in Central Texas, there is no end to the kinds of outdoor and fitness-related activities you can get your hands on around Plum Creek. 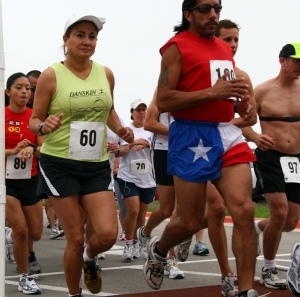 This year, the fitness offerings within the neighborhood itself expand significantly with the Plum Creek Challenge Race Series, a new, year-long fitness experience that is open to the general public and to Plum Creek residents as well. The family-friendly race series expands upon existing races and the fitness culture of the neighborhood, with plans for expansion in future years, and kicks off this year with the Negley 5K, which takes place in the neighborhood this Saturday, March 1st. In its fourth year, the Negley 5K was originally created as a fun way to get Negley Elementary students moving and active. 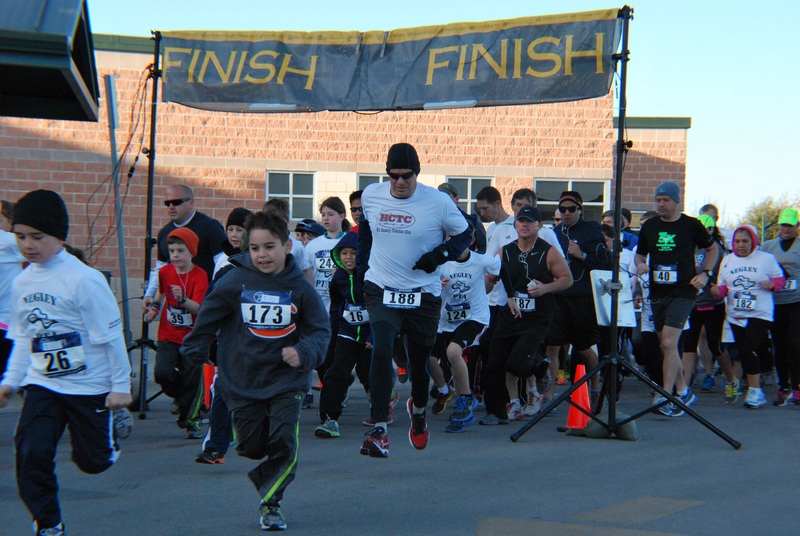 Over time, parents and other people from Plum Creek and beyond have begun participating in the annual race, which has 5K, 3K and 1K courses to accommodate participants of all ages, and is probably the most popular race in the community, to date. The idea for the Plum Creek Challenge Race Series germinated from the popularity of the existing races in the neighborhood, including the Negley 5K and two races associated with community-wide events in the neighborhood, Front Porch Days and Hootenanny on the Hill, which take place in May and October, respectively. These races are popular among Plum Creek residents and those from the Central racing community, but participation fluctuates considerably from race to race. Thus, the Plum Creek Challenge came into fruition: to encourage people to stay active and participate in all of the races throughout the year. So, the Plum Creek Challenge unites the three existing races in the neighborhood, the Negley 5K, the Front Porch Days 10K / 5K and Hootenanny on the Hill, and adds a 4-mile Fourth of July race to the neighborhood’s repertoire – while also creating an incentive for people to participate in all of the races, all year long. The Challenge is divided into four racing divisions: the long track and the short track for adults, and the same for kids. To encourage committed participation in all races, finisher medals and exclusive long-sleeved t-shirts are awarded for each individual who completes all four races, and there will be overall male and female Series Champions for the overall times for the long and short track adult divisions. 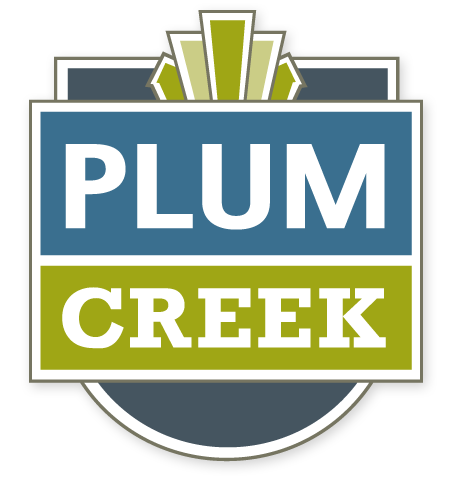 Over 30 people have signed up for the Plum Creek Challenge to-date. Depending on the success and participation in this years’ Plum Creek Challenge, the two Plum Creek Race Coordinators, Jennifer Crosby and Brandee Otto, hope to add even more races to the neighborhoods repertoire, so that those who wish to participate in the whole challenge will be able to run an entire marathon or a half marathon over the course of the year. This would eventually manifest in approximately one race every two months, and could include such exciting races as the Color Run, scavenger hunt races and more. So, if you’re in the area Saturday March 1st, come cheer on the racers and learn more about the Plum Creek Challenge, so you can participate in the rest of the races throughout the year. Details and more information are available here. 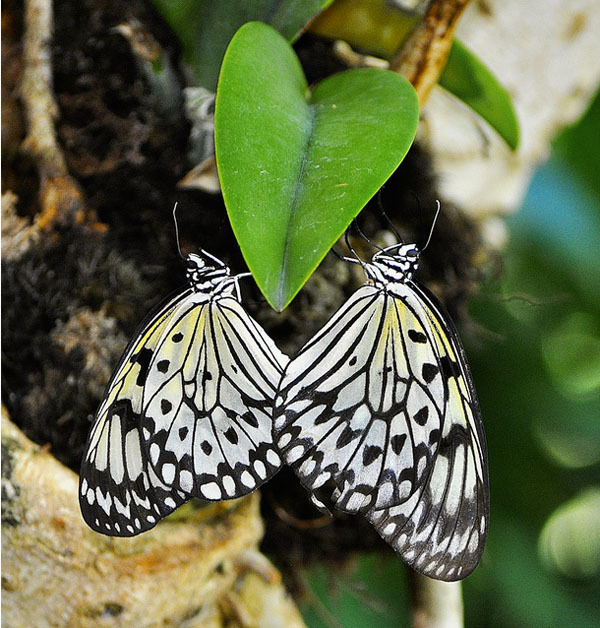 It’s that time of year again – Valentine’s Day is around the corner and as you’re researching fun, romantic things to do with that special someone, Plum Creek has compiled a list of ways to show your love for your honey and the beauty of nature in Central Texas. Botanical gardens are cheap and romantic date option, and Kyle is bounded by two beautiful botanical gardens to the north and the south. 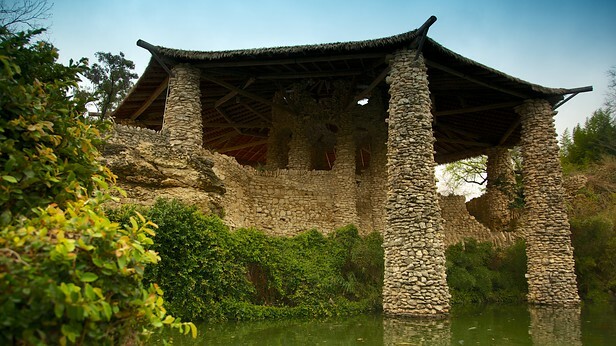 The Zilker Botanical Garden in Austin is a serene and peaceful date spot located in Central Austin in close proximity to other outdoor hot spots, like Barton Springs Pool and Zilker Park. The 30-acre facility features a number of theme gardens, with romantic nooks and crannies for intimate moments, tinkling waterfalls, ponds and other hidden gems, Of course, the best time for the garden is the spring, once it starts getting warmer, but there is still beauty to be found. The Garden’s proximity to many other date spots is an added bonus – Zilker Park, Barton Springs, great restaurants and bars along South Lamar, and more. San Antonio also has a couple of flower gardens, including the San Antonio Botanical Gardens and the Japanese Tea Gardens. Both are located near each other, in Central San Antonio. The Tea Gardens is a quiet and lush area that contains a large open-air pagoda, as well as koi ponds and a waterfall. It is such a beautiful and romantic space that it is a San Antonio favorite for weddings and engagement photography, so you know it’ll facilitate flying sparks. Plus, it’s near the sprawling Brackenridge Park, the San Antonio Zoo and the Pearl Brewery. Elsewhere in Central Texas, there are scenic Hill Country drives, wine country and Valentine’s Day specials out in Fredericksburg, countless cute and interesting restaurants, breweries, day spas and more. Pick your location of choice – goodness knows pretty much every town in Central Texas and the Hill Country has something beautiful or something going on – and do a little research. There are plenty of ways to love your honey and love the beauty of nature. And if it turns out to be cold on Valentine’s Day weekend, there’s no short supply of indoor date ideas either! The weather in Central Texas has been unseasonably cold this January with two “snow days” happening here within the past week! And while more snow and ice seems unlikely – considering it’s been a few years since we’ve even seen snow flurries of this magnitude until now– we’ve compiled some indoor kid-friendly activities in the Central Texas area to keep your kiddos entertained for the rest of the winter – so they aren’t stuck in front of a screen the next time the temperature drops too far for outdoor fun. Here in Kyle, The Jumpy Place is a great place to take elementary-age kids. It’s a socks-only inflatable play center for children 10 and under – just south and across the highway from Plum Creek. 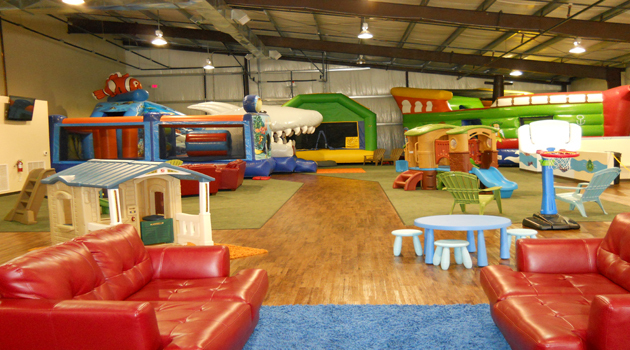 They do both advance parties and walk-ins, so those weekends where you just want to get your kids out of the house but don’t want to venture too far from home, The Jumpy Place is a great start. They even have free wifi and coffee for parents – so, you can have some fun relaxing while your kid bounces all that energy out. Who’ll enjoy it more? Depends on how badly you need that grown-up coffee time. This November, if all goes well, residents of Kyle will have even more indoor entertainment options available within the city limits – with the opening of Texas Cinema’s entertainment complex at Kohler’s Crossing and I-35, just minutes away from Plum Creek. The 75,000 square-foot facility would include 14-lanes of bowling, a two-story laser tag arena, over 40 arcade games, a restaurant and a bar and 12 movie auditoriums. Currently, the project is slated to open in November, so once the weather starts turning cold again, there should be additional entertainment options available in Kyle for adults and kids alike, all in one location! Until then, residents of Kyle and Central Texas have other indoor entertainment resources within 20 minutes from home. 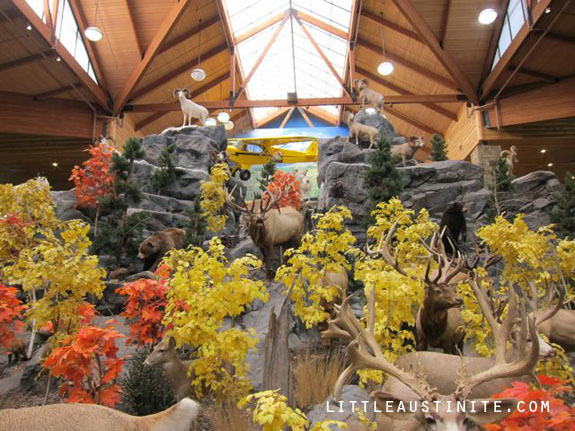 While Buda’s Cabela’s might not be top of mind when it comes to indoor entertainment, the outdoor retail giant is a kid’s education and entertainment hub, even if you don’t buy a thing! A huge animal-based diorama is the centerpiece of the store, and consists of various animals standing on a mountain, as if in their natural habitat. The display can be viewed from both the lower and upper levels of the store, and is surrounded by a pond, complete with live trout! Cabelas also has a large walk-through aquarium section and two other dioramas. Not to mention an in-store restaurant with exotic fare such as elk, bison and wild boar sandwiches, and a general store that sells old-fashioned candy (like fudge). If that’s not an afternoon of fun for your little one, who knows what is! 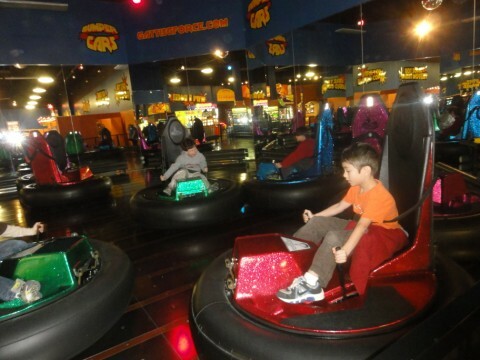 Further north in Austin, the Southpark Meadows Gatti Town is another fantastic place to take the kids to play indoors. The restaurant features over 9,000-square-feet of the latest video and redemption games, electric bumper cars and mini bowling, not to mention all you can eat and drink buffet. Gatti Town dining rooms also come complete with big-screen TVs, and a variety of dining areas including a sports room and a fun flicks room for family entertainment. So bring a book, a friend or your iPad and set the kids loose after stuffing them full of pizza and you’ll have some tuckered out kiddos at the end of the afternoon. Chilly nights in December are the perfect time for packing up your family and friends to explore some of the beautiful holiday light displays available across Central Texas and the Texas Hill Country. 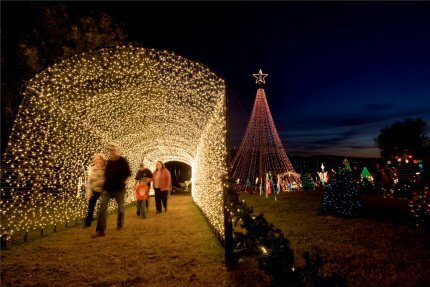 The annual Texas Hill Country Regional Christmas Lighting Trail is an assemblage of lighting displays from small towns throughout the region, including Austin, Bandera, Blanco, Boerne, Burnet, Fredericksburg, Johnson City, Marble Falls and Wimberley. To help you navigate the displays, the lighting trail website offers a helpful map and schedule of events and activities in each city. Bandera is one of the stops on the Regional Lighting Trail, and, as the ‘Cowboy Capital of Texas’, Bandera will be hosting its annual Christmas Singing in the Saddle event at the Longhorn Saloon tomorrow evening, December 18th. Visitors are encouraged to bring, or rent horses, for Christmas caroling down Main Street at this event, and there will be hot chocolate and sweet treats available for visitors at the end of the parade ride. While Fredericksburg, Texas is a popular getaway year-round, the town is extra special during the holiday season. Over the course of the holidays, Fredericksburg’s unique German heritage is on display with holiday décor, which includes a 26-foot-tall Christmas Pyramid at the town’s Marktplatz. Other attractions include an outdoor ice skating rink, 150 specialty shops with crafts from local artists, 75 restaurants serving everything from traditional German cuisine to unique Hill Country dishes, and over 400 bed and breakfast options for overnight guests. Just down the road from Fredericksburg, the Johnson City courthouse lighting display is one of the largest lighting displays in the state. 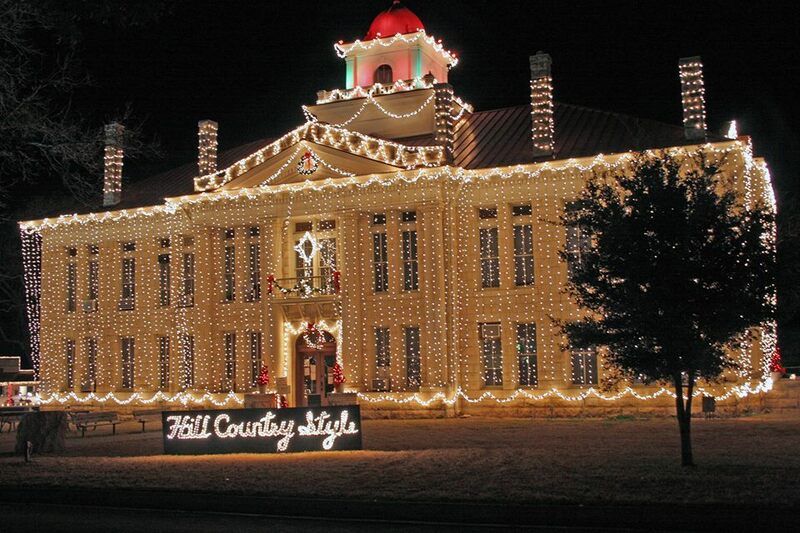 Millions of lights cover the historic Blanco County Courthouse, creating a visual treat. The lights are up until January 1st, and the inside of the courthouse is open on Saturday and Sunday nights throughout December from 6:00-9:00 p.m. for photos in front of the large Christmas tree, and the local Garden Club will be on hand to sell crafts and ornaments. Located on Highway 281, just 40 miles west of Austin, Blanco, Texas celebrates the holiday season with the lighting of Blanco’s downtown Bindsiel Park. The park lights are open for holiday visitors until January 6th and, while in Blanco, visitors can enjoy the many antique shops and boutiques along the courthouse square as well. Another notable lighted courthouse in the area is the historic Burnet County Courthouse in Burnet, Texas, which shines with thousands of white lights all over the building’s façade. Burnet is also home to a massive 18-foot multi-color Christmas tree, which is perfect for photo ops. The Burnet lighting display is open nightly until January 1st. Since 1991, the Marble Falls Walkway of Lights has also delighted visitors of all ages. Over 2 million lights dot 150+ decorated sculptures, which create a magical reflection on the waters of Lake Marble Falls. This enchanting self-guided tour is open nightly beginning at 6 p.m. until 10 p.m. until January 1st. Also just outside of Austin, Wimberley hosts its 16th Annual Trail of Lights at the EmilyAnn Theatre & Gardens. This year’s trail features 8 acres of glowing displays decorated by local businesses and community groups, and Santa and Mrs. Claus will be on hand to celebrate the season every Friday and Saturday evening until Christmas. Nearby, in Austin, the beloved Trail of Lights at Zilker Park is open nightly until December 22nd, with an exciting schedule of entertainment from local bands. Holidays in the Hill Country are unlike any other celebration. The region offers free, easily accessible lighting displays and events sure to charm visitors of all ages. So pack up your crew this weekend and experience the joy of the season. Thanksgiving has come and gone, which means the Elgin CHRISTmas Tree Farm is open for business. 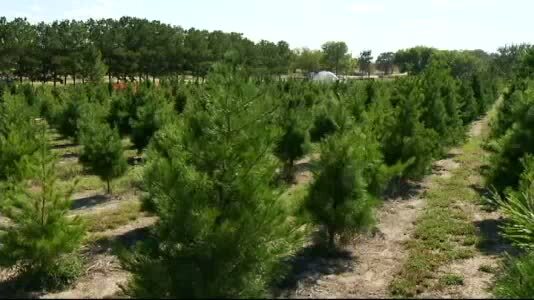 The Christmas tree farm has been a beloved Central Texas tradition since it opened as a small retirement business in 1984; and today, the farm has the largest selection of Christmas trees in Central Texas. Each year the Elgin CHRISTmas Tree Farm plants over 6,000-7,000 seedlings, and they have multiple fields that they sell from each year. Their farm has a variety of different trees, including Virginia Pines, Loblolly Pines, Leyland Cypresses and pre-cut Fraser Fir Trees, and not only are you getting an authentic, Central Texas-grown Christmas tree at their farm, you’re getting an experience along with it as well! The farm features fun, family-friendly activities including a petting zoo, scenic hayrides, mazes, a Christmas Cottage and a children’s playground. They’re open every day until 5:30 p.m., except later on Thursdays and Fridays, when they’re open until 8:30 p.m.
Elgin is a bit of a drive from Kyle for a Christmas tree. (And totally worth it, for the experience of the farm and the smell of fresh pine in your home throughout the holiday season.) But if you need another reason to make the journey worth your while, Bastrop is hosting their annual Lost Pines Christmas celebration this weekend (Thursday , December 12th through Sunday, December 15th). 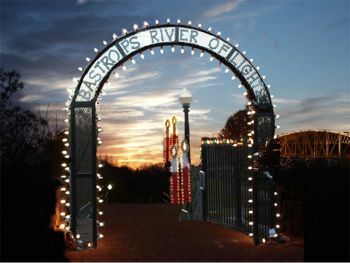 Each day of the holiday party offers something different and unique, including stargazing and other activites at McKinney Rough Nature Park, the Christmas Street Market in downtown Bastrop, Mr. and Mrs. Claus at the Bastrop Public Library, an array of shows and performances including The Nutcracker, as well as lighted Christmas parades, the Bastrop River of Lights and more. More than 30 family-friendly activities occur throughout the four day weekend, and each event is distinctly and uniquely Bastrop. Visit the Lost Pines Christmas website for a full schedule and details about the event. It’s a great way to have some holiday fun away from home, for a day or for the weekend!